Taking on the Monster Mile, NASCAR Sprint Cup drivers and teams are set to compete on one of only two all-concrete track surfaces in the stock car racing tour. The third race in the 2011 Chase for the Sprint Cup, focus on the top-12 drivers has dominated the past two NASCAR events aided by the wins of Tony Stewart. However, with 43 cars in a Sprint Cup Series race, Dover International Speedway was one of the final 8 races to obtain glory for any driver. 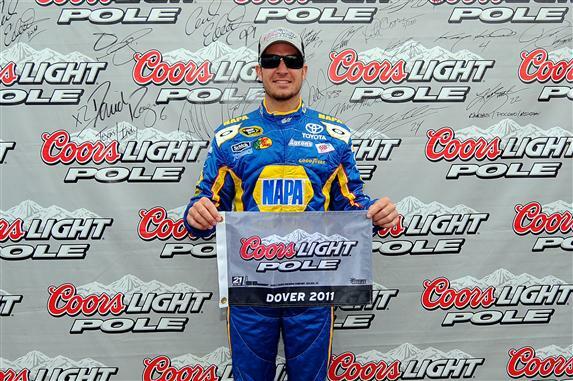 In NASCAR Sprint Cup qualifying for the AAA 400, the #56 NAPA Toyota driven by Martin Truex Jr emerged as pole sitter on Saturday. Cutting a lap around the 1-mile track in 22.641 seconds, the Michael Waltrip Racing-owned stock car averaged 159.004 miles per hour. Stepping over Kurt Busch's #22 Dodge for the premium front row position, Truex Jr was a mere 0.003 seconds faster around the Dover oval. In 2009, Martin Truex Jr claimed his first and only NASCAR Sprint Cup Series at Dover International Speedway's spring event with #1 Chevrolet fielded by Dale Earnhardt Incorporated. Assembling the top-5 behind Martin Truex Jr and Kurt Busch for Sunday's AAA 400 at Dover is Paul Menard, Carl Edwards and Kyle Busch. With only 4 Chase contending drivers in the top-10 after qualifying (Jimmie Johnson in 6th joins the before-mentioned Kurt Busch, Carl Edwards and Kyle Busch), many of the championship fighters for the 2011 Sprint Cup will start deep in the field. Most notably in 28th place is current Chase championship points leader Tony Stewart. His immediate rivals were not entirely able to capitalize on Stewart's stumble in qualifying. Brad Keselowski starts 15th while Kevin Harvick (who trails the #14 car driver/owner by 7 points after 2 races) will launch 22nd tomorrow. Starting at 2 PM eastern time, the AAA 400 at Dover International Speedway is committed to run Sunday. Chance of showers is predicted for the event but is rated around a 30-40 percent probability.